Bloomington, Ind. 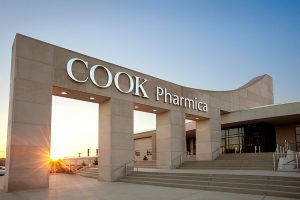 – Today, Cook Group completed the sale of Cook Pharmica to Catalent, Inc. (NYSE: CTLT). Cook Pharmica, now known as Catalent Bloomington, expands Catalent’s capabilities by adding more drug substance and drug product expertise and capacity to serve patients worldwide. The completion of the acquisition of Cook Pharmica will strengthen Catalent’s position as a leader in the rapidly growing biologics development, analytical, manufacturing and finished product supply industry. With Cook Pharmica’s available space and expertise, Catalent creates another biologics development and manufacturing center of excellence in its site network. The purchase allows the Bloomington site to deepen relationships with customers and grow their already successful business. Catalent plans to invest aggressively in this site and in the rest of the Catalent Biologics network to build a true global leader in the biologics market, which will help Catalent to improve the lives of patients around the world. Catalent Bloomington will remain under the leadership of Tedd Green. In addition to the sale of Cook Pharmica, Cook Group recently announced the intent to purchase the former GE site near Cook’s world headquarters on Bloomington’s west side. The sale is progressing as expected and Cook recently received approval from the Bloomington City Council for an in lieu of annexation agreement on Cook properties including the planned purchase of the vacant GE facility. Cook Pharmica is a contract development and manufacturing organization (CDMO) that provides biopharmaceutical companies with a unique One Source, One Location model for development, clinical or commercial cell culture manufacturing, parenteral product manufacturing, and secondary packaging. Cook Pharmica was founded in 2004, and, over the last 13 years, Cook Pharmica has invested heavily in its facility, people, and processes. Catalent is the leading global provider of advanced delivery technologies and development solutions for drugs, biologics and consumer health products. With over 80 years serving the industry, Catalent has proven expertise in bringing more customer products to market faster, enhancing product performance and ensuring reliable clinical and commercial product supply. Catalent employs over 10,000 people, including over 1,400 scientists, at more than 30 facilities across five continents, and in fiscal 2017 generated more than $2 billion in annual revenue. Catalent is headquartered in Somerset, New Jersey. For more information, visit www.Catalent.com.